For students with autism spectrum disorder, perspective-taking and putting themselves in someone else's shoes are difficult skills to master. 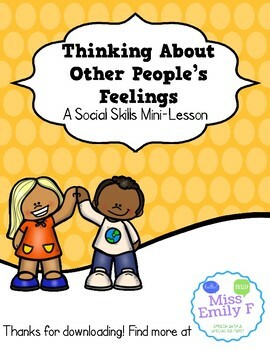 This short social skills lesson introduces the idea of considering other people's feelings when we make a choice about how to react or behave. Activities in this lesson also place an emphasis on cause-and-effect relationships, explaining how our own actions can affect other people's feelings and how they think about us. Social Story (1)- "I Can Think About Other People" is a one page social story that introduces the topic to students. It describes the difference between considering only ourselves and considering everyone involved when making a choice. Who Am I Thinking About? 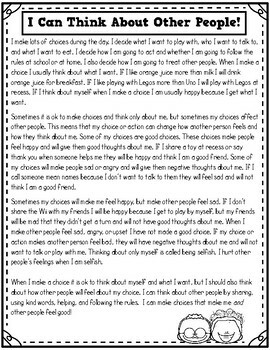 Multiple Choice Worksheet (1)- The first worksheet in this set asks students to identify whose feelings were considered in a hypothetical social scenario. How Do I Feel? How Do You Feel? 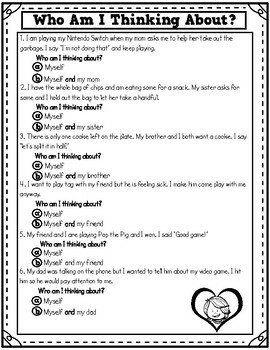 Worksheets (2)- The next two worksheets present a social scenario and ask students to identify how all people involved feel as the result. 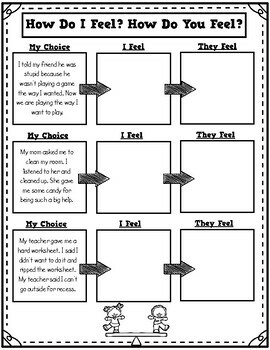 I Can Make Better Choices Worksheet (1)- The final worksheet asks students to come up with a more considerate action or choice than the one described in the presented scenario.